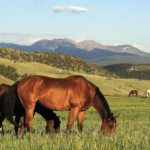 David and his wife Elizabeth live in the Hangen Ranch area and David is more familiar than most with the country around Alderfer Three Sisters, Elephant Butte and more as he keeps his horses fit for competition. David moved to the US from the United Kingdom in the early 1980’s. His love for the horse is apparent as you learn more about him and how he has been a continual student of the horse to give his own the best care possible. 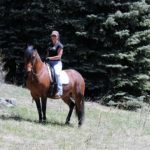 In trail riding competition there is something for every level of rider and type of horse. As with any sport, the higher level of competition, the more intricate the training, nutrition and fitness. 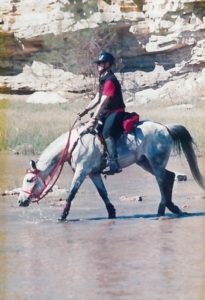 David started competitive trail riding as a novice just getting into horses and found his niche in this great sport. In addition to the benefits of just being outside with your horse, is the gorgeous scenery to be found at the competitions. Check out the websites for more information. David is currently competing on “Chanz”, a 12-year-old Arabian from the Rush Creek Ranch in Nebraska, who bred and used Arabians for their ranch work. 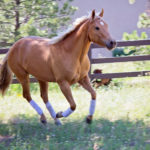 Rush Creek Arabians are sought after endurance horses and have won many top competitions. His former competition horse, Excepzional is an 18-year-old gray Polish Arabian. My wife, Elizabeth, and I moved to Colorado in 1996 for a better quality of outdoor living than was possible in NE Oklahoma. Also, having determined we needed a hub airport, four-year public university availability, and a high quality of life to be able to attract engineering talent to my company, we begun a location search. After considering the Chicago, Dallas, Salt Lake and Atlanta areas, we settled on Denver as our hub. Following an extensive tour of Front Range communities in Colorado, we finally arrived in Evergreen where it was evident that this was THE place to experience mountain living while enjoying easy access to the amenities of a major metropolitan area. 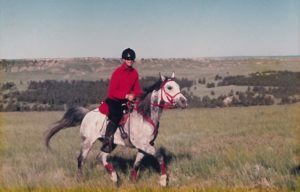 Around 2000, we decided that an ideal motivation to get out and explore Colorado, would be by owning horses of which neither of us had done before. For my wife this meant purchasing an ex national champion Paso Fino who turned out to be one of the most difficult of horses away from the arena. I was undecided since my limited experience in organized trail riding had not excited me. However, once I learned about endurance competition and the fact that you did not have to grow up on a horse to participate, I realized I had found my sport. This led to the purchase of a breeding Arabian stallion, Excepzional. This 3 ½ year old, magnificent animal was almost totally “green” and with little experience being a horse. Consequently, I suffered many unscheduled dismounts and usually arrived back at the barn considerably later than my horse. Three months of six evenings a week training loosely based upon Pat Parelli’s methods, yielded a completely different horse: one that I was able to put into conditioning training and limited distance competition as a four-year old. There are two primary types of long distance trail competition. One, organized by NATRC (North American Trail Ride Conference NATRC.org) is like time trials where a set distance has to be completed in a certain time with penalties for too early and too late. Rolled into this is horsemanship judging where handling of the horse on the trail and in camp is judged along with evaluation of horse and rider to negotiate obstacles in a controlled manner. Typically, NATRC has 25 to 35 mile one day rides and 40 mile two-day competitions in novice and experienced categories. The second competition is AERC’s (American Endurance Ride Conference AERC.org) endurance competitions. These events are offered as single day competitions, or multi-day longer distance rides including 5-day 50 miles per day. Endurance competitions are 50 miles or more each day with a completion time of less than 12 hours. 100 mile competitions have to finish within 24 hours (including vet checks). Riders compete by weight class from feather to heavyweight as well as classes for juniors. 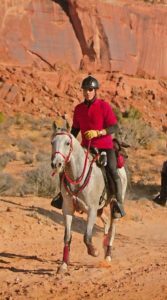 Endurance rides are outright speed competitions with the fastest horse across the line that can be considered “fit to continue”, the winner. For either type of competition, the training is similar. First is the building of cardio-vascular systems, then muscle, and finally bone density. This is accomplished by gradually increasing the distance and then speed of training but overall, long and slow is the best means to build endurance. Heart rate monitors are often used to measure the horses’ response to training with lower heart rates corresponding to higher fitness levels for given training intervals. Horses often start out competing at shorter distances such as 25 miles and then progress to full distance in their second season. However, for many riders, the shorter distances are fun and less stressful on the horse and they stick with the shorter distances for their entire career. Getting started in trail competition is as simple as just turning up and volunteering to help out. This can get someone comfortable with the how the events are run and a great way to meet people who can mentor the newcomer. There is nothing like competing to provide the motivation to get out of the house and spend some quality time with your horse. All breeds can participate but, of course, some may be more competitive than others. Trail Riding Competition often suits owners who enjoy visiting fantastic locations around the country and the camaraderie that competing brings.